STOPit is a leading technology company providing mobile and administrator software and services to help school and student safety and issues related to student well-being. 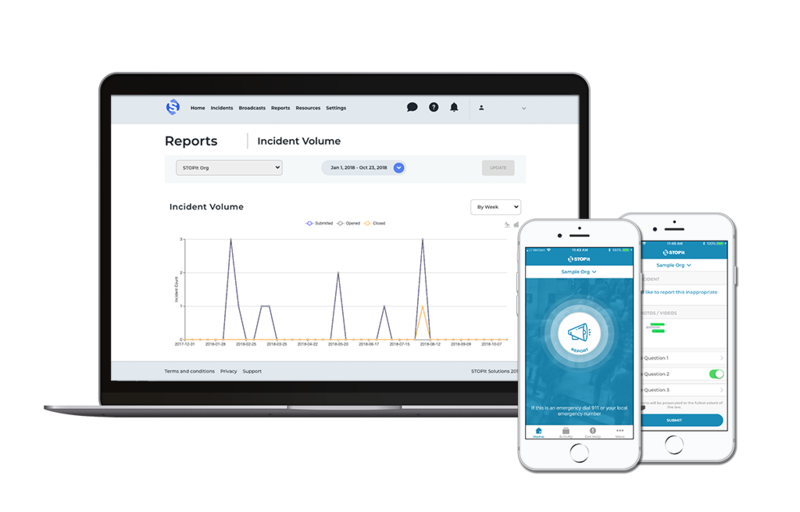 The incident management platform is being used in thousands of schools across the country. Developed using evidence based research on student behavior and collaboration with administrators on how to assist them to make their jobs easier, the solution is leading the market in technology and related services specifically designed to deliver maximum results and maximum efficiency for busy school administrators. The STOPit Mobile App, STOPit Web, and STOPit Reporting Hotline provide a safe way for students to share information with you and your school administrators so that you can provide help – as quickly and efficiently as possible. Administrators can use STOPit to follow up using the unique STOPit MessengerTM function as well as broadcast alerts and announcements to the entire student body. STOPit provides valuable services to administrators including 24 hour incident monitoring, content about issues and resolutions, training/promotion services, and tools to help get in front of issues and manage risk. All reports are monitored and you are contacted if there are early warnings ranging from violent school threats through student mental health issues and a concerned friend reaching out before there is a larger issue. Schools use STOPit to reinforce a positive culture that assists on higher attendance and academic performance, and lower state reporting of bulling issues. A STOPit associate will contact you and answer any questions you might have, provide a demo if needed, and guide you through an online order form process. Once ordered, the Customer Success team will contact you to review the Launch Kit. STOPit takes 20 minutes to set up, and the launch kit includes all of the announcement materials needed to make your program an instance success. STOPit also includes access to a regular weekly administrator training session for administrators that would like to learn from our team how the system works and how they can use it.